I thought this was a gem so I put it here for everyone to enjoy. & heres his current offering...Priceless, well cheap anyway! YOU are bidding on the rolling chassis for a Honda CB500T, 1978 vintage. The CB500T was possibly one of the nastiest Honda twins ever made, coupling excruciating vibration, lousy handling and a horrendous engine in an unholy union of incompetent engineering. So the chassis isn't worth talking about. THIS BIKE DOES NOT GO. IT DOES NOT RUN. The lack of engine is a clue. Ditto the lack of any fuel tank, a seat, exhausts, ignition system and anything else usually associated with an internal combustion engine and forward motion. Even freewheeling it will be fraught with excitement, because it hasn't got a front brake either. See? Nor handlebars, so steering it will be an adventure. A frame, forks, pair of wheels, and a few odds and sods, and what you see in the pic (try http://www.chateau.murray.dsl.pipex.com/CB500Twreck.jpg if you want) is your lot. 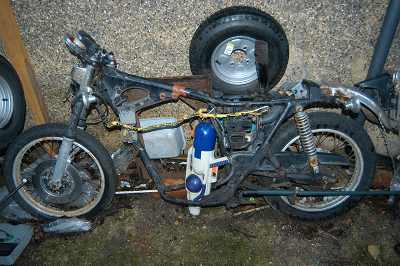 Now, I've got a bit tired of the decerebrated turnips that bid on Ebay, as perusal of the old C90 that I sold (item no. 2442354423) will show. Possession of a powerful computer is no substitute for a working brain. Only the other week I was sitting beside an American female in a business centre in a Chilean hotel, as she tried to connect to her Yahoo messager that normally pops up on her screen at home. Needless to say, it didn't there. I suggested she try her Yahoo email, and she asked how to find that. So I told her to go to yahoo.com and watched as she added an extra w to the www, no dot and an extra c in com. And then she called the hotel girl over and complained to her she'd forgotten her Yahoo password, and could she help? The girls's face was a picture. I have no idea what: "You complete imbecile!" is in Spanish, but I can mime it now. At this point I left them to it. And these people have Ebay accounts.. terrifying, isn't it? So anyone I consider particularly bereft of clue will have their bids cancelled. Then there are the people who screw up in their bidding, by bidding £111 instead of £11. A tip: if you suffer from Parkinson's Disease, don't bid on Ebay. And instead of retracting the bid, they send me damn stupid long-winded, illiterate and nonsensical emails (the sort of thing that, on paper, would be written in purple crayon with LoTs oF rAndoM CApITaL LeTters). Same applies. Then there are the people who bid just to see what happens. They've no intention of buying: they just bid to see the numbers change and their name on the screen. These are the sort of people who'd bang lumps of plutonium together because they've heard it makes a pretty spark. Ebay's infested with the sods. So what is this heap good for? Beats the hell out of me. For the last two years it has been used as a ground anchor for my trailer. That's right, I've kept it because it's just a large heavy lump of pig iron that prevents something rather more valuable being stolen. You may find a better use for it, but I never have. I'm installing a proper ground anchor for the trailer and was going to throw this heap away, but it occurred to me that if some lunatic was prepared to pay £41 for the C90 mentioned above, then I might (a) get some cash and (b) save myself the trouble of carting it down to the dump. There are mental defectives on Ebay who will pay for anything. Finding someone prepared to pay for that C90 was like finding someone willing to hand over cash in exchange for mud. So someone might want to buy this derelict example of Japanese industrial archaeology. Starting price is 99p. Buyer collects by the end of December 2003. I can deliver, but I'll charge 50p/mile, each way, so you don't have to be Stephen Hawking to work out that if you live 25 miles away it'll cost £25, but as ever, this ad has to cater to the lowest forms of intelligent life in the Great Ebay Universe, so there: I've spelled it out. Oh, and for the real thickos, look at the "location" tag. I'm in south-west London. Nowhere near, for example, Glasgow. What's intriguing is that the main frame tube has been welded up, just aft of the engine top mount, and painted with red lead. This implies either that it cracked through vibration, or that someone thought of chopping the frame and changed his mind, or that somebody wanted to try the angle grinder and welding torch he got for Christmas. But the wheel hubs are OK. The back wheel is the same as for the CB550, and they have a reputation for cracking their hubs. This one's fine, if you have a CB550 with a cracked hub. There are some primitive electrical components still on it, but don't ask me if they work because even Edison would consider it too much hassle. Amazingly, I have a valid registration document for it. Zero feedback bidders I'd prefer to email me with their contact details, or run the risk of Planet Earth's Neutronic Bid Zapper cancelling their bids. The feckwits who ask all sort of dim questions will be treated harshly. WYSIWYG. Planet Earth's Alien Feedback Division will deal ruthlessly with any NPBs. Beep. Like a child's plastic tricycle. (Dateline 4 hours after auction start). Christ, so it begins. No, the SuperSoaker isn't included. Nor the plastic bowl, spare wheel for my trailer or indeed the wall behind the wreck, which is in fact the side of my house. And, blinking as their dulled reflexes try to cope with the light, and their rudimentary nervous systems try to make sense of the complexities of an on-line auction, out they come.... the first bidder is in the US of A. Look, people, I've had emails from people saying they're bidding, and intend to honour the bids for the laughs they've had, but have no intention of actually taking possession of this valuable collector's piece. Fine, thanks, and I'll raise the glass of beer your bid pays for to your health, but if I just wanted the cash I'd put up an auction saying "Send me money now!" and rely on the mental bottom-feeders of Ebay to go: "Coo, I think I'll bid on that...". In other words, I really do want somebody to pay me and take this thing away. Optimistic and under the terms of this auction, unenforceable, but there must be someone out there who actually wants it. Guess what? One of our cats has just pissed on it. Honest. Buyer to bring rubber gloves. Oh, and if you find this fair and honest attack on Ebay's more intellectually challenged members amusing, and you really want to show your appreciation, you can click on the cafeshops link above and buy a crappy mug or Tshirt. Better than bidding a fiver and leaving me still in possession of this thing. Ooooh, wasn't welt2 a clever little bunny, bidding when he's in Australia? If you'd emailed me to say you were serious, welt2, I might have left the bid up, but with zero feedback you've just proved yourself to be one of the turnips. And there your bids go, vapourised... Zappp! And they come crawling out of the woodwork. You block his bids and you get an email: "Well aren't you a miserable pr*ck." Nope, I'm not, I'm a good-natured soul (see, I even edited your obscenity), but if anyone's a pr*ck it's a zero feedback-rated ebayer in Australia who's only bidding to waste my time. Now, does anyone else want to see their name in lights? Oh Good God. Ebayers, meet g4-gertje. g4-gertje, meet the sharp end of my keyboard. g4-gertje wants to know if I'll just sell the indicator brackets for some project bike he has. g4-gertje is in Belgium and thus separated from me by a few hundred miles, the English Channel and, I suspect, several dozen IQ points. Does this auction say: "will flog off minute components bit by bit"? NO! It's a damned auction. Buy the whole thing or nothing at all. I mean, the winning bidder (who I notice has a feedback of 1 and is teetering on the edge of Bid Cancel Canyon, might want them as well. Unlikely, but can you imagine actually winning this pile of crap and finding that the one component you want from it has been sold? On third thoughts GF....hand your tinfoil crown over to this guy.......what a laff! See the other auction of this heap!